MANILA, Philippines - The Commission on Higher Education (CHED) issued statement about the latest 2015 Quacquarelli Symonds (QS) World University Rankings released on September 15. CHED is concerned on simplistic interpretation of the drop in the rankings of three universities from last year: the University of the Philippines (UP) from 367 to 401-410 bracket; the Ateneo de Manila University (ADMU) from 461-470 to 501-550; De La Salle University (DLSU) from 651-700 to 701+. The University of Santo Tomas (UST) retained its position in the 701+ bracket. "While Philippine universities are certainly disadvantaged by the country’s lower expenditure for education compared to our ASEAN neighbors, putting the blame solely on inadequate government investment and concluding that the education offered by these universities is necessarily inferior to that of their counterparts in the region just because they slipped this year oversimplifies the issues and complexity of the university rankings game," CHED said in a statement. The methodology indicators and the weights used for the QS world university rankings are: Academic Reputation (40%), Employer Reputation (10%), Research Citations per Faculty (20%), Student-to-Faculty Ratio (20%), International Student Ratio (5%) and International Faculty Ratio (5%). CHED explained that even our top universities are still teaching universities, with a large undergraduate enrollment. Hence, the percentage of faculty members publishing in indexed journals will certainly be lower than in universities in the region and the world whose faculty is not heavily loaded with undergraduate teaching. This redounds to our faculty not rating as well in terms of research volume and reputation. During the Elsevier presentation at the APEC High-Level Policy Dialogue on Science and Technology in Higher Education on 13-14 August 2015, the world-leading information solutions provider disclosed that the Philippines produces publications of high quality despite the quantity, judging from citations of published works. While this may be a source of pride, the Philippines is trailing other ASEAN countries in terms of volume of publications. Beyond incentivizing publications, the country’s top universities would need to have a much higher proportion of faculty members producing publications worthy of citation if they are to improve their rankings. This is a key policy area given its implications on entry qualifications of faculty, criteria for promotions and tenure, and ratio of graduate to undergraduate students in the context of Philippine realities, among others. "It must be also noted that despite declining world rankings, three Philippine universities rank within the top 300 globally based on the “Employer Reputation” indicator, a gauge of which schools are perceived by employers as producing the best graduates. Based on a survey of more than 40,000 international employers, UP placed 120th in the world, followed by ADMU and DLSU at 259 and 292, respectively." The Commission believes that the rankings of our top universities do not necessarily reflect their overall quality but engagement in the rankings game is a key concern for CHED because university rankings shape an uncritical national and international public’s perception of the quality of our institutions and are real in their consequences. 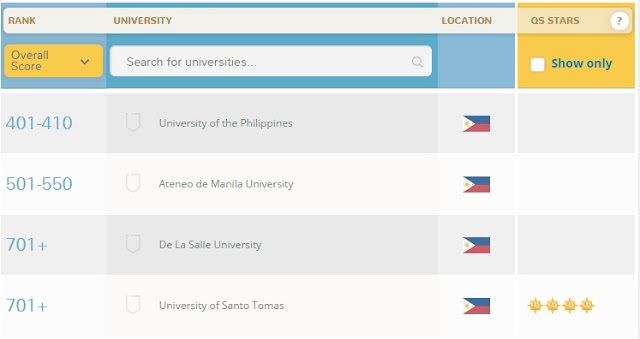 CHED is thus determined to find ways for government to provide funding support to these universities. In light of global and national imperatives, the rankings issue raises important policy questions for the Philippine government and the universities the Filipino public expects to rank among the best institutions in Asia, if not the world.